St Cecilia is the Patroness of two things – music and blindness. At first, these two things would seem to have little in common beyond the possible consideration that music is the art most accessible to blind people (in fact this is a somewhat "modern" consideration since in days when poetry and stories were more commonly spoken aloud this was much less the case). It is important to bear in mind, however, that the lore of traditional saints often goes deep into pre-Christian times and contains the profoundest of symbolisms. For the devotee of Our Mother God, the symbolism of music immediately brings to mind Sai Thamë, who governs the Golden Order of the Universe. She is the Law that holds the stars within their courses (the "music of the spheres") as well as that which properly regulates the order of human life and conduct. 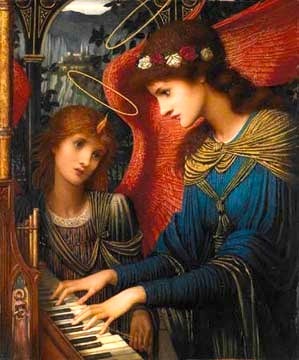 When shown an image of the Divine Musician, such as the picture of St Cecilia on this page, a Déanist will immediately recognize her as Sai Thamë. When we are told that she is also the patroness of blindness, we naturally ask "what other deity-form is traditionally blind?" There is only one notable one and that is Themis, the well-known figure of "Justice". Themis, who holds the balance and regulates Law and Order, not only in the limited human sense to which patriarchal imagery has tended to restrict her, but in the deeper cosmic and universal sense, is clearly an image of Sai Thamë. Indeed her very name comes from the same primordial root as thamë (as does Sanskrit Dharma/Pali Dhamma – meaning also Law in the profoundest sense of the Universal Harmony). Why is the universal Harmony – which takes the form of both Law and Music – associated with blindness both in the case of Themis and of St Cecilia? The "vulgar" answer in the case of Themis/Justitia is that "justice is blind" in the sense of allowing no improper considerations to affect the scales of balance. Justice should be blind to persons. High or low, rich or poor, justice must look only at the facts of the case and the law. Looking at this in less specifically legalistic "down to earth" terms, we may understand this as meaning that the Cosmic Harmony, the Music of the Spheres, or Golden Order, is transcendent. It is not influenced by things of a worldly order. It does not "see" the limitations of our human world, but remains perfect. 5. All nature is a vast and subtle music to which the innocent soul is close attuned. 6. The profane assay to sever themselves from this music, fixing new laws of gain and self-advantage against the law of universal love. Another symbol of Sai Thamë seems to be completely opposed to the symbolism of St Cecilia and Themis/Justitia. 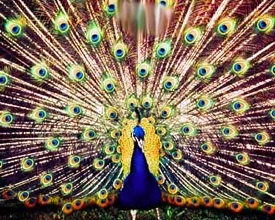 The two birds most closely associated with Sai Thamë are the swan and the pavanelle (peacock). The pavanelle, far from being a symbol of blindness, is said to have a thousand eyes, and is symbolic of the all-seeing nature of the Golden Law. It may be thought that a thousand all-seeing eyes are the exact opposite of blindness, and in a sense they are. However, the "opposition" in metaphysical terms is a double-edged one. One is all-seeing in the light of pure Truth precisely in the degree that one is blind to the errors and distractions of "worldliness", and conversely, she who is most "knowing" in the eyes of the world may be the blindest in the ways of the Spirit. The outer eyes must close that the inner eye may see. 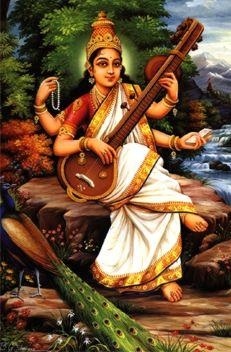 Sri Saraswati is also the Divine Musician. She is almost always depicted playing a stringed instrument, and usually accompanied by either a swan or a pavanelle. Sri Saraswati is the deity of learning and wisdom, and thus to Déanists, she represents the qualities of both Sai Thamë and Sai Mati, the Divine Wisdom. Sri Saraswati may be seen as Sai Thamë in that aspect that represents the Matic, omniscient aspect of the Golden Order that governs all things from a drop of dew to the furthest galaxy. Her seeing of all things is the precise compliment of her "blindness" to the contingencies of human error or deviation (injustice, athamë). Maid is the only creature who, by her power of choice, may act outside her thamë. It is precisely this deviation, this seeing outside the whole, that true thamë lacks, and it is in this sense alone that she is blind. St Cecilia is a traditional image of the thamë which is blind to the outer world and fully attuned to the Music of Being, and for Déanists is a perfect image of Sai Thamë, the Divine Musician.